Now that Hank Aaron’s home run record has been mixed up in steroid allegations and confessions, perhaps the most hallowed record in Major League Baseball now belongs solely to Joe DiMaggio who went on a 56 game hit streak in 1941. DiMaggio had earned the nickname “Yankee Clipper” due to his all-around fantastic play on the New York Yankees and had won four World Series championships by the time he went on his famous hitting streak, so he was already pretty cool; but it was the hitting streak that made him truly immortal. During the hitting streak, DiMaggio batted .408, hit 15 home runs and had 55 RBI. For the season, DiMaggio hit .357, with 193 hits, 43 doubles, 11 triples, 30 home runs and 125 RBI. He was named the American League MVP and led the Yankees to victory over the Brooklyn Dodgers in the World Series four games to one. That sounds like a pretty good year doesn’t it? kept British morale high and helped citizens and soldiers alike sustain the German air attacks and eventually led to the Germans postponing any further raids against the British. This postponement was the first real defeat the Germans had faced and is seen as one of the turning points of World War II. So then why 1942? 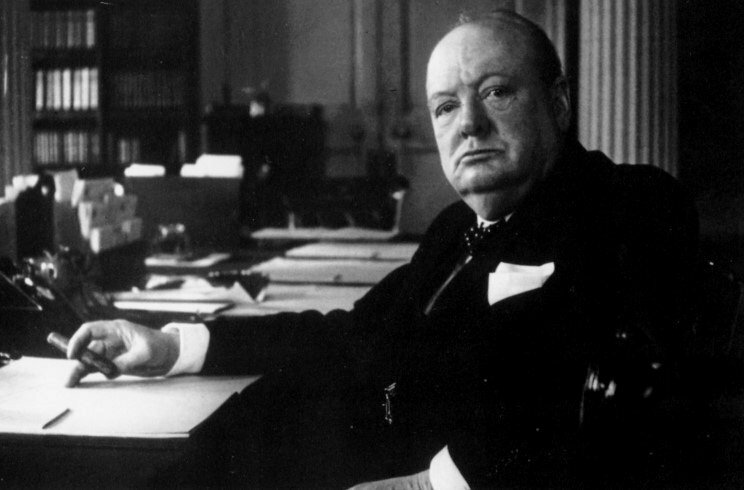 By 1942, Churchill’s ability as a global rhetorician, a leader and diplomat was at its peak as he was helping supply the Soviet Union with supplies on the Eastern Front as well as starting the liberation of Western Europe—in tandem with the United States—during the Allied counter-attacks, which began in 1942. When the tide of World War II was turning in 1942, Winston Churchill was there to make sure the Nazi’s wouldn’t turn it back. 1943 is the most controversial year in the World’s Coolest Dude Award’s long history. It was originally awarded to Joseph Stalin for his leadership of the Russian people and army to defeat the Nazi army on the Eastern Front in World War II. The Russians defeating the Nazis is seen as perhaps the biggest key to Hitler’s eventual demise. By 1943, the Russian army under Stalin’s leadership had pushed the Germans back toward Berlin and had retaken much of the territory that the Germans had initially invaded since 1939. At the time, the World’s Coolest Dude Committee could not overlook Stalin’s achievements towards stopping the Nazis. However, when the atrocities Stalin inflicted on the Russian people became public years later, the Committee revoked the award and gave it to Bob Hope whose tireless work for the USO during World War II has often been cited as perhaps one of comedy’s greatest achievements. He was also considered perhaps the funniest man alive at the time. Eiesenhower had been an accomplished soldier in the United States military before he was given the rank of Supreme Allied Commander of the Allied Expeditionary Force in January of 1944. This rank meant that he would lead the Allied forces on the beach at Normandy during the operations known as “D-Day.” As we all know (especially from Saving Private Ryan), D-Day was a brutal battle and offensive manuever by the Allied Forces, but its success provided perhaps the second biggest victory/turning point of World War II. The victory allowed the Allies (specifically a large contingent of Unites States forces) to establish solid position on the Western Front in an attempt to push the German forces back towards Berlin from the east, hopefully leading to the Soviet Allies meeting up with the U.S. and Britsh Allies as the Germans were surrounded; and this eventually happened in the spring of 1945. However, it was Eisenhower’s leadership during D-Day and the subsequent ground offensives throughout 1944 that greatly helped Steer the Allies to eventual victory. Certainly a hero and certainly deserving of 1944’s World’s Coolest Dude Award. The year 1945 saw another very tight and interesting World’s Coolest Dude race. There were many members of the committee who felt very strongly that Harry S. Truman deserved to win the award due to his decision to drop the atomic bomb and officially end World War II. However, after three successive years of key World War II figures winning the award and the overall world exhaustion with the war itself, the World’s Coolest Dude committee decided to go in a very different direction. 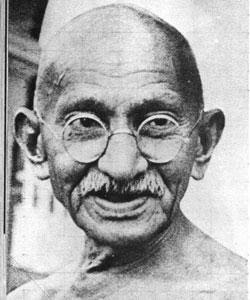 Mohandas Ghandi had basically lived two to three lives by the year 1945. He had been a lawyer in South Africa, led various political uprisings, popularized civil disobedience and even made fasting cool for the first time since Jesus Christ. Like Martin Scorcese’s Best Director victory in 2006 for the film Departed, Ghandi’s 1945 World’s Coolest Dude Award was more of a lifetime achievement nod. Now, don’t be deceived, Ghandi was relevant as ever in 1945. Ghandi had started the “Quit India” movement in 1942 to protest India’s involvement in a war that was ostensibly being fought for democratic freedom, while the Indian people were still denied that very right by the British government. Ghandi was 75 years old at the time and his leadership in the “Quit India” movement led to the Indian Independence Act 1947 (which did lead to many casualties, but that was nothing Ghandi could prevent). 1945 was perhaps the last year before Ghandi’s health started failing as well, so in hindsight it makes the decision seem even more sensible. Let’s face it, Ghandi was one of the most influential figures of the 20th century and human history overall. If he was given a lifetime achievement award, who cares if its was in 1945? It was a good year for Ghandi, which means he sure as well was the World’s Coolest Dude. When looking back from 2011, its hard to separate the film A Wonderful Life from its status as one of the all-time holiday classics. I mean we have countless jokes and ways of making fun of the lines “Teacher says anytime a bell rings an angel gets its wings,” or “I’ll lasso the moon,” or “CLARENCE!” However, at the time of its release, A Wonderful Life was seen as a major disappointment. People found it overly sentimental and it failed to break even. 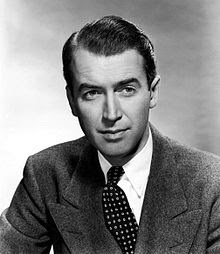 Regardless of popular opinion, the World’s Coolest Dude committee saw something in the movie and in James Stewart’s performance. Modern examples such as Drake’s Take Care and Kanye West’s My Twisted Dark Fantasy and even the Beach Boys’ Pet Sounds have shown that sentimentality and over-emotion can go a long way if done the right way; and It’s A Wonderful Life does sentimentality the right way. How can you argue with George Bailey giving out money to the town people at the bank? Or his overall sadness/nobility in giving up on his dreams to see the world in order to do well for others? Sure these seem like virtues that are too good to be true, but they are actual dilemmas and short-comings we face in life. “Am I too nice?” is a question we often ask ourselves if we feel that we are being taken advantage of and then we doubt our kindness, when really, it is something that should be trusted. George Bailey learned that in the end, and who better to act out those realizations that long faced, sweet-molasses talking, slick-backed hair wearing Jimmy Stewart in the prime of his career? The public may not have got it at the time, but the World’s Coolest Dude committee did. He also stole 29 bases and was named the 1947 National League Rookie of the Year. It was a controversial choice at the time, but the World’s Coolest Dude committee could not go in any other direction in 1947. What Jackie Robinson did was groundbreaking, it was unprecedented, it was important, and hell, it was cool. Despite the fact that Truman ended World War II by choosing to drop the atomic bomb, helped set up the Marshall Plan, and was a big proponent of the United States’ involvement in the United Nations, he still entered the 1948 election as the underdog. After the war the U.S. economy had trouble adjusting to the postwar life. Even with Truman’s efforts to rapidly demobilize the military and reappropriate those funds for domestic economic growth, the economy was struggling and Truman was losing favor in the polls. The United States public were also wary of involvement with fallen German and the Soviet Union so they did not necessarily support Truman’s international outlook, something that his opponents played up. He was seen as a longshot to win the 1948 election. But, like Rocky in Rocky III, Truman got back to his roots. He went on a “whistlestop” train tour of America giving speeches wherever he stopped and drawing up a huge support base that eventually propelled him to a shocking victory. 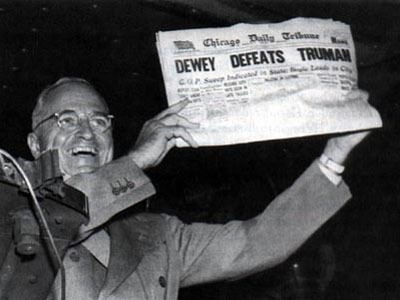 A victory so shocking, that it led to an immortal photo where Truman is holding a copy of the Chicago Tribune that had pre-emptively published the headline “Dewey Defeats Truman” on their front page in victory. Truman is smiling because he was an underdog that came out on top, got a second term as president and won the World’s Coolest Dude Award for 1948. Frank Sinatra is a legend. 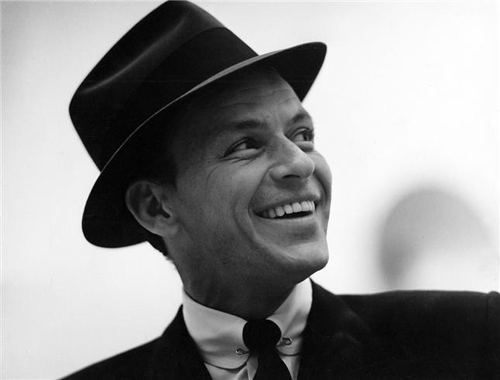 Much of his work may not be as appreciated by the younger generations of the world today (to them I say, go buy the album Watertown), but he is a legend, an American icon nonetheless (read Gay Talese’s legendary article “Frank Sinatra Has A Cold”). By 1949, Sinatra was 34 years old and had already chalked up one of the great legendary music performances of all-time with his 1942 performance at the Paramount Theater in New York; had released a number one album and had coined the phrase “Sinatramania.” The Sinatra that most people know is the Las Vegas Sinatra from the 1950’s. The “Rat Pack” Sinatra and the “Mob” Sinatra. Now that “Sinatra” is cool, that Sinatra was legendary in his own right, but in 1949 we saw the peak of “New York” Sinatra, which was a phenomenon all to itself. “New York” Sinatra existed in some void of the world, simultaneously representing the “Old America” and pointing towards “New America,” which is what he would fully reinvent himself as in the 1950’s after an initial lull period at the beginning of that decade. “New York” Sinatra personified the rise from the Great Depression to Postwar America and is in many ways a more mythical and mysterious figure (as mysterious as someone as iconic as Sinatra can be) than the “Rat Pack” Sinatra. Whereas “Rat Pack” Sinatra was impossibly famous and even nefarious, “New York” Sinatra was the hometown hero, the legend that could do it all. He balanced on the ledge of two America’s and could easily be seen as the bridge. In 1949, Frank Sinatra hit his first peak and he was the World’s Coolest Dude. One of the absolute truths of the modern era is that when you ask someone what kind of music they listen to they answer, “anything but country.” This fact is due to the perversion of “country music” by contemporary Nashville. Hank Williams is country music. There may not be an artist in music that has had more tribute paid to him than Hank Williams. In 1950, Williams had already made a stunning run to close out the 1940’s by releasing hit tracks such as “Lovesick Blues,” “Mind Your Own Business,” and “My Bucket’s Got a Hole in It.” He had also just had a son, Hank Williams Jr., that he nicknamed "Bocephus." In 1950, Williams was arguably at the top of his game releasing singles, “Why Should We Try Anymore?,” “Long Gone Lonesome Blues,” “Why Don’t You Love Me,” and “Nobody’s Lonesome for Me.” Even if you don’t know the music, just look at those titles—they set the standard for country music. Hank Williams brought country music from its spread out roots in Appalachia and in the south and turned it into a true “modern” music. A music that would later influence Elvis. 1950 was the last year before Williams began his downfall into alcoholism that eventually led to his death in 1953. In 1950, he had hit singles, he had the look and he cemented his legacy as the Godfather of Country Music.